In a big boost to former Haryana Excise and Taxation Minister Venod Sharma, Congress President Sonia Gandhi today nominated him as the chairman of the powerful 40-member campaign committee for the coming Lok Sabha elections in the state. The district administration and the police here are apparently in a state of high alert to prevent any untoward incident like terror attack in view of Republic Day celebrations. Two brothers from the city will be conferred the state-level bravery award posthumously by Governor AR Kidwai at a Republic Day function in Rewari. The award will be received by their father Mohan Suri and mother Kiran. The President’s Police Medal for Gallantry has been awarded posthumously to Umer Mohd, a constable of Haryana, on the occasion of Republic Day. The fate of eight Sikh students of the Akal Academy, a senior secondary school at Ratia town in this district, hangs in balance after they trimmed their hair and beard. Former Haryana Chief Minister Om Prakash Chautala today made a plethora of promises to the people and said he would transform the system once he came to power in Haryana after the next assembly elections. Readymade clothes, garments, shoes and other consumer durables worth crores were destroyed in a major fire that broke out in a showroom, Fashion Camp, in the local Rori Bazar in the wee hours today. Rajbir Deswal, DIG (CID), Haryana, said here today that all art forms projected only the positive and creative side of society as well as the artist and there was nothing that could be termed as negativity in art. The state government has unleashed a comprehensive plan to strengthen the transmission and distribution network of Rohtak district under which a 400 KV, two 220 KV, one 132 KV and five new 33 KV substations would be set up. To meet any eventuality caused by global economic crisis, we need to adopt preventive and promotive health approach to economy in place of curative, which is possible by accepting ‘needonomics’ instead of ‘greedonomics’ confining to needs and not greed, said Dr M M Goel, Professor and chairman, Department of Economics, Kurukshetra University, here today. The Model Town police here has booked Keerat’s father-in-law Chander Bhan Batra, mother-in-law Kanta Devi, brother-in-law Sanjeev Batra, sister-in-law Anshu Batra and two others, residents of the Model Town Colony here, on charges of subjecting Keerat to cruel treatment and criminal breach of trust. A 22-year-old youth allegedly shot himself dead last night at his residence in the Kamla Nagar locality here under mysterious circumstances. The police has recovered an unlicensed country-made revolver from the spot. That the committee is high profile can be judged from the fact that it includes Chief Minister Bhupinder Singh Hooda, Haryana party chief Phool Chand Mullana and union ministers like Hans Raj Bhardwaj, Rao Inderjit Singh and Selja. Sharma’s nomination is being interpreted as a rebuff by the high command to those who have been claiming that he is no longer a favourite with the central leadership of the party. Sharma had quit the Hooda Cabinet after the Delhi High Court had taken up the hearing of the Jessica murder case, in which his son Manu Sharma was an accused. This perceived “unhappiness” of the high command with Sharma was being cited as one of the factors due to which the Hooda Cabinet is not being expanded. Sharma’s opponents claim that while Hooda is determined to have him in his Cabinet, the high command is not permitting him to do so. The committee includes former party chiefs Shamsher Singh Surjewala, Harpal Singh, Tara Singh and Rao Nihal Singh. Finance Minister Birender Singh, Agriculture Minister HS Chatha, Education Minister Mange Ram Gupta, Local Bodies Minister AC Choudhary, Irrigation Minister Ajay Singh Yadav, Power Minister Randeep Singh Surjewala, Tourism Minister Kiran Choudhry and Health Minister Kartar Devi have also made it to the committee. Besides Haryana Congress working president Kuldeep Sharma, Rajya Sabha MPs from the state Ram Prakash and Ishwar Singh are also on it. Among the MLAs who have been nominated as its members are Karan Singh Dalal, Shadi Lal Batra, Udai Bhan, Dharam Pal, Shiv Shankar Bhardwaj, Dharambir, Rao Dan Singh, Anand Singh Dangi and Jitender Singh. Deputy Speaker Azad Mohd and senior leader Khurshid Ahmed represent the Meo Muslims on the committee. Sumita Singh, president of the Haryana Mahila Congress; Sanjay Chhokar, president of the state Youth Congress; Rahul Rao, president of the state unit of the NSUI; and Chhota Singh Chauhan, chairman of the state Seva Dal; will be the special invitees. Since the wee hours today the police increased its visibility. The district has been virtually sealed off since last evening and the city today witnessed high percentage of the police personnel patrolling public places, the main roads and crossings. The police vigil appeared to be very high at the railway stations and at the bus stands. Vehicles were searched and common man was frisked at various places. The administration has issued directive to the owners of shops in malls and main markets to ensure security around their premises. The Resident Welfare Associations and various social organisations have also been urged to maintain vigil on their part. The civil administration and the police have already faced more than half a dozen hoax call about possible bomb threats in the past about six months. The authorities do not want to take any chance on possible terror attack in the city or terrorists possibly sneaking into the city. The boys - Abhishek (9) and Suraj (7) - died while saving a boy from drowning in a water tank in 2007. Both had gone to their native village Hazampur in Hisar district during holidays, when they noticed a boy, who was drowning, crying for help. Seeing this, they both jumped into the water to save him. Abhishek and Suraj were awarded with the National Bravery Award for this heroic deed by Prime Minister Manmohan Singh last year. Their father, who works as a pharmacist with the District Red Cross Society, Gurgaon, received the award from the Prime Minister on their behalf. DC Deepti Umashankar has directed District Child Welfare Officer Sajjan Singh to make arrangements to bring Mohan Suri from Gurgaon to Rewari. President’s Police Medal for distinguished service has been awarded to Lekh Raj, sub-inspector, State Vigilance Bureau, Panchkula, and police medals for meritorious service have been awarded to nine other police personnel of Haryana. 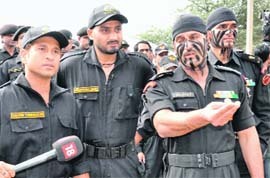 They are Alok Kumar Mittal, Superintendent of Police, Rohtak, Raj Kumar, sub-inspector, State Vigilance Bureau, Panchkula, Kailash Chander, sub-inspector, 2nd Battalion, Haryana Armed Police, Madhuban, Lakhwinder Kumar, sub-inspector, CID, Bhim Sain, sub-inspector, Headquarters, Newal, Parmod Chand, assistant sub-inspector, SCB, Panchkula, Ram Kumar, assistant sub-inspector, IPG, Ambala Range, Nirmal Singh, assistant sub-inspector, Sadar police station, Yamunanagar, and Vinod Kumar, head constable, State Vigilance Bureau, Panchkula. The school is affiliated with the CBSE board and is run by the Kalgidhar Society, Baru Sahib in Himachal Pradesh. The students have been shown the door and their parents have been asked to look for some other school. The students are - Gurpreet Singh, Navjot Singh, Gurjinder Singh, Lavpreet Singh, Gurpreet Singh, Shamsher Singh, Sandeep Singh and Gurvinder Singh. It is with a lot of requests and persuasion by the parents that the students have been allowed to sit in their pre-board examinations. But they have been ostracised and are not being allowed to mix up with the other students. “My son was having ulcers on his head so he got his hair trimmed to get some relief. But the school authorities acted in a dogmatic manner and asked him and seven others to leave the school,” alleged Gurcharan Singh, whose son Navjot Singh is among the eight students who are facing the axe. “We and our children apologised before the school authorities in writing, but they have refused to budge and have told us to find some other school. Our children have gone in depression,” he alleged. Baljinder Singh, Satwinder Singh and Sukhjinder Singh have also echoed the allegations of Gurcharan Singh. Principal Indu Sharma said the school authorities had acted in accordance with the rules and regulations set up by the management. “All Sikh students have to follow certain rules regarding religion and they have given an undertaking to us while getting admission to the school. These rules apply for Sikh students only and we have Hindus, Christians and even Muslim students and there are no such restrictions on them,” she said. She said one of these students cut his hair and place a fake “jura” under the turban, while other had trimmed their beard. She said the authorities were yet to take a decision whether to allow them admission in the next class or not but she added that the students have already applied for their migration. “We will not allow any Sikh student to the school unless he partakes in Amrit ceremonies,” she said. Chautala was addressing the INLD-BJP alliance’s “vijay sankalp rally” in the local Nehru Park today. INLD’s state president Ashok Arora, former minister Sampat Singh, MP Tirlochan Singh and BJP’s Capt Anhimanyu and Ganeshi Lal were among the prominent leaders who addressed the rally. Though the rally was propagated the NDA’s rally, the show belonged to former MLA Abhay Singh Chautala, who also managed the stage. Accusing the present Bhupinder Singh Hooda government of working against the interests of poor and low-level government employees, Om Prakash Chautala promised that the NDA government would change the system, which he alleged, had been working for the benefit of the big industrialists, big business houses and the rich few of the country. The former Chief Minister announced that INLD-BJP workers would gherao the state assembly in Chandigarh on February 12, when his son Ajay Singh Chautala’s “jan akrosh yatra” culminates at Panchkula. Chautala also criticised the UPA government at the Centre and said the government had shown cowardice in the face of the terror attack on Mumbai on November 26. Reminding people that the parliamentary elections were drawing near, Chautala called upon people to press the button on “specs” and the “lotus” to bring the NDA to power at the Centre. Criticising the Haryana government, Sampat Singh said many of the Hooda government’s recent decisions had come under the scanner of the Punjab and Haryana High Court, causing embarrassment to the government. The BJP’s state general secretary, Capt Abhimanyu, said when LK Advani “will be the next Prime Minister and Atal Bihari Vajpayee the next President of India”, no terrorist would dare to look towards India. Earlier, addressing mediapersons at his residence, Chautala said the INLD and the BJP had no dispute over seat sharing and only “winning candidates” of either party would be fielded in the coming parliamentary elections. An electric short circuit is believed to be the cause of the fire though the authorities are yet to find the reason. 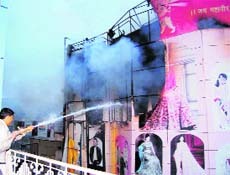 Goods stored in the three floors of the four-storeyed Fashion Camp store were destroyed in the fire, while the items stored in the ground floor were been damaged by water used to extinguish the fire. Krishan Lal, owner, has refused to comment on the quantum of the loss, but sources said it would run into crores. He said a short circuit could be the reason of the fire. “We used to turn off the main switch, but yesterday we forgot to do that,” he said. The fire broke out at about 3 in the morning and firefighters were informed immediately. Fire engines from Sirsa, Fatehabad, Rania, Kalanwali, Dabwali and the local Air Force Station toiled throughout the day to extinguish the fire. SDM Harish Bhatia, DSP Dhiraj Setia and several other officers of the administration reached their and oversaw the firefighting operations. Deswal, who is widely known as “writer cop” in literary circles, said every artistic activity was meant only for the betterment of society at large. A poet expressed his or her feelings through imaginative use of words. Likewise, painters do so through creative use of colours and brush strokes. In the end all forms of art only added to society’s creative side. He said he had never encountered any negativity in art, as he believed that artistic expression was born out of a person’s creative side and creativity could by no stretch of imagination be negative. Deswal said budding poetess Saraf’s latest collection was a fine example of modern Hindi poetry. Balbir Singh, Commissioner, Income Tax, and RS Jaglan, registrar, Guru Jambheshwar University of Science and Technology, were among those present. The network would cost around Rs 250 crore. It was stated by Chief Minister Bhupinder Singh Hooda after laying the foundation stone of a 33KV substation in Old Power House Colony here yesterday. The substation will be constructed by the Uttar Haryana Bijli Vitran Nigam (UHBVN) at an estimated cost of Rs 250 lakh. A case under Sections 498-A, 406 and 34 of the IPC has been registered against them on a directive of the court of the ACJM who has issued it on a petition earlier filed by Keerut, wife of the late Rajeev Batra, son of Chander Bhan Batra. In her petition, she complained that soon after Rajeev’s demise, her in-laws started treating her cruelly. The deceased, identified as Navin (22), son of Prem Singh, was reportedly fed up of unemployment as his kin found a torn matriculation certificate of the victim. While no suicide note has been recovered from the spot, the family suspects that Navin may have shot himself as he had not been able to find a job for himself and was under stress. The family expressed ignorance over how and from where the deceased fetched the gun.